The 29-year-old has been included in the Indian squad for the five Tests in England beginning in early July. The relief in Pankaj Singh’s voice is apparent even as he struggles to make himself heard over the clamour of a wedding function that he is attending in his hometown of Amethi. The 29-year-old, who last played an ODI for India in 2010 — his only international appearance — has been included in the Indian squad for the five Tests in England beginning in early July. “I have waited a long time for this and it is an absolutely wonderful feeling. For the past four seasons, I have been performing consistently and taking wickets, and this time around I just felt that something would work out,” he says. Singh is, perhaps, Indian cricket’s biggest ‘almost-there’ story. Picked for the 2007 tour to Australia, the Rajasthan pacer spent the entire tour on the bench, ferrying drinks. Since then, he has been ritually ignored for the longer format. A brief appearance in the ODI team notwithstanding, Singh has just been biding his time, racking up the numbers in his wickets column, waiting for that “one call”. 300 First Class wickets at 25.52 and 21 five-wicket hauls later, Rajasthan’s work-horse says he couldn’t have been more ready to don the India Test cap. “This season I picked up 39 wickets in eight matches. I bowled well on every kind of track. I have worked very hard on my fitness, added some more pace to my bowling and now I just need an opportunity to show what I have got,” he says. Bowling tirelessly on placid tracks, running in with the same zeal throughout the day and the willingness to put his body on the line for his side, all these qualities says Hrishikesh Kanitkar, the former India Test batsman who captained Singh for four seasons, are what sets Singh apart. “Over the past few years, Pankaj has been single-mindedly focused on his bowling. He knows his bowling in and out, making him a very dangerous bowler. He is not scared to improve. Over the last three years, he has worked very hard on his fitness and that has allowed him to bowl faster and also extract disconcerting bounce off the wicket,” says Kanitkar. The son of a retired Army-man, Singh was a promising volleyball player, even playing at the state championships, before deciding that cricket was the sport that he really wanted to play. 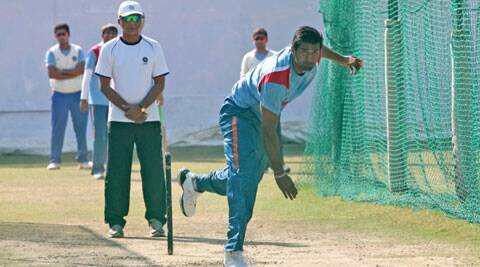 An aggressive bowler, he shone for India at under-19 level, took a bagful of wickets on an India A tour to Zimbabwe and Kenya. Since the 2009-10 season, Singh has averaged 38.8 wickets every season, but for some reason or the other, he has always been overlooked. “When Rajasthan won the Ranji Trophy, I thought I would get my chance. Somehow it never happened. It was difficult to keep on motivating myself, there were hard times, but I am glad I stuck it out, kept on bowling well,” he says. Kanitkar says Singh’s doggedness and his desire to keep on fighting for his team are two qualities that can really make the difference for him in England. “Pankaj knows his areas. He has great control of swing and after bowling so many overs, he knows that he can work out batsmen. That is his strength. Also, his accuracy has improved tremendously, he has the uncanny ability of plugging away. On flat tracks he is a handful, in English conditions, he can cause some real problems,” he says. Is he satisfied all those wickets have finally borne fruit? Singh is vehement in his disagreement. “I want to go and pick up wickets in England. I want to make a real contribution to the team. If I manage to do that, then I think there might be a little bit of satisfaction,” he says.